Managing Directors Brian Cumberland and J.D. 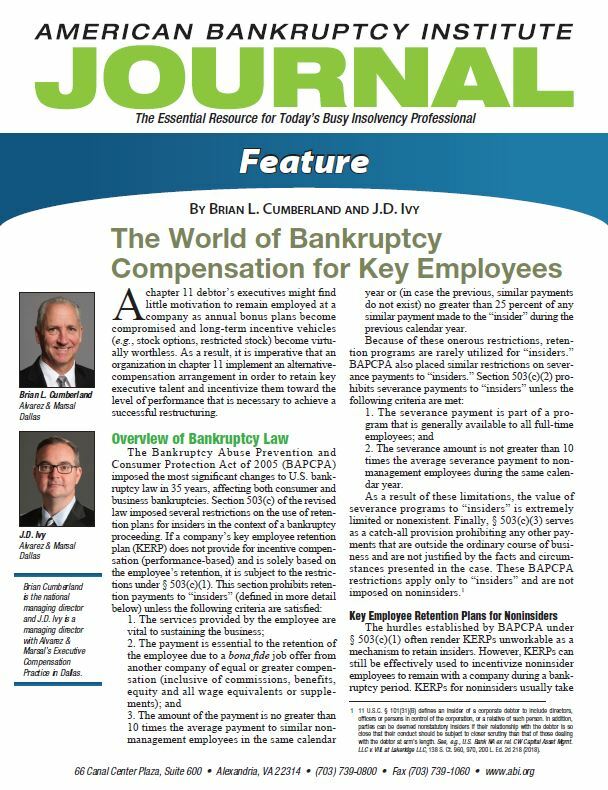 Ivy recently co-authored a featured article in ABI Journal discussing bankruptcy compensation. They discuss how a chapter 11 debtor’s executives might find little motivation to remain employed at a company as annual bonus plans become compromised and long-term incentive vehicles (e.g., stock options, restricted stock) become virtually worthless. As a result, it is imperative that an organization in chapter 11 implement an alternative-compensation arrangement in order to retain key executive talent and incentivize them toward the level of performance that is necessary to achieve a successful restructuring. This article was originally published in the ABI Journal, Vol. XXXVIII, No. 1, January 2019.